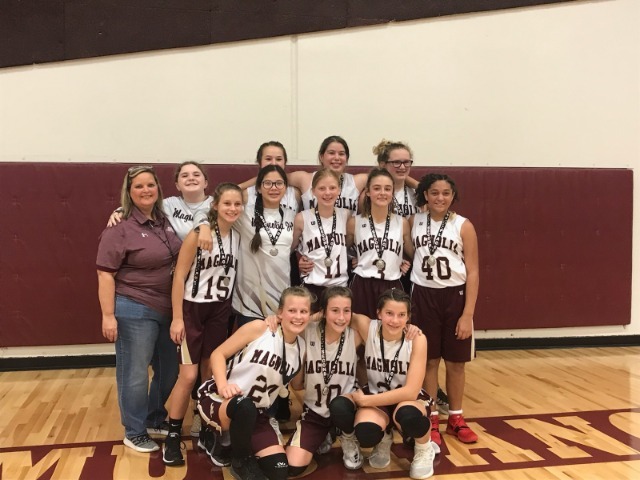 The Lady Mustang Gold team battled hard in the MJH tournament this weekend. Despite their valiant effort they fell 27-20 and ended up 2nd place overall. Game one on Friday found the ladies victorious over Brabham 29-7. Riley Moore had 16 points, Riley Navarez and Cloie Jansky had 4 apiece. Game 2 on Saturday morning the ladies pounded Lynn Lucas 29-13. Moore had 11, Jansky 8, and Faith Matocha 6. In the championship game against Willow Wood, Matocha had 8, Moore and Jansky 4 apiece. All of the girls played hard each game !